The Knowledge (Written) Test is offered in 7 languages Tuesdays and Thursdays 3:30 PM – 5:30 PM and Saturdays 1:00 PM – 3:00 PM. The cost is $30 per attempt. Unless you already have a Washington ID, you must pre-apply through the Dept. of Licensing’s “License Express” and bring the ID number plus valid photo identification. Road Test: $40 using your car; $60 using a 911 Driving School car. Please call 360-210-7146 to schedule. Road Test with a 30 minute practice followed by the test: $75. Please call 360-210-7146 to schedule. PLEASE ARRIVE 10 MINUTES BEFORE YOUR SKILLS TEST SCHEDULED TIME. Looking for a Washington State driving school in Camas/EastVancouver? Look no further than 911 Driving School. Students at 911 Driving School receive training and guidance from police officers. Our classes are professional, informative and fun. We use videos and state-of-the-art technology in our classes to give students a fun and stimulating learning experience. Getting a driver’s license is a milestone in your teen’s life. It is something to take seriously. At 911 Driving School, you can rest assured that your student is in good hands. We have a premier Washington driver’s education school with classes taught by none other than police officers. Our students learn the rules of the road from the experts. 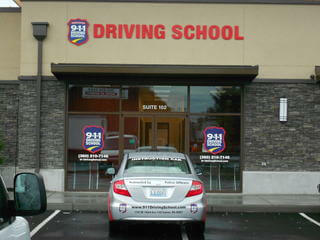 911 Driving School is a premier driver’s education school that also offers Washington State Driver’s License Testing. The Knowledge (Written) Test is offered Tuesdays and Thursdays 3:30 PM – 5:30 PM and Saturdays 1:00 PM – 3:00 PM. (All Traffic Safety Education courses include a free Knowledge Test.) The Skills (Driving) Test is offered by appointment. PLEASE ARRIVE 10 MINUTES EARLY FOR YOUR SKILLS TEST. 911 Driving School also provides behind-the-wheel driving lessons and adult defensive driving courses. Call us today at 360-210-7146 for more information or to make an appointment. The Knowledge (Written) Test is offered Tuesdays and Thursdays 3:30 PM – 5:30 PM (no seating after 5:00 PM) and Saturdays 1:00 PM – 3:00 PM (no seating after 2:30 PM). You must have a Washington State ID number and photo ID. The fee is $30 per attempt. The Skills (Driving) Test is offered by appointment 7 days per week. The fee is $40 in your car (proof of insurance and current registration is required and your car must be in good working order) or $60 in our car. We also offer a half hour practice followed by the test for $75. However, you must have an Instruction Permit or valid license from another state or country for the practice portion. The practice must be done in our car, so there is no extra charge to use our car for the test. PLEASE ARRIVE 10 MINUTES BEFORE YOUR SKILLS TEST IS SCHEDULED TO BEGIN. The student must be at least 15 years of age. A $50 deposit is required at the time of registration. It is refundable up to 3 days before the course start date. No enrollment will be accepted after the third scheduled class. No refunds will be given after class 3. The student must have a Learner’s Permit by the third class. Parents are to attend the first class session (Parent Night) if at all possible. The student and parent must read, understand and agree to the 911 Driving School – Camas Policies and Agreement Form (or agree to these policies during online enrollment). Two hours and twenty minutes in length: two hours for class lesson including a ten minute break; twenty minutes for simulation instruction. No cell phones during class time, they must be turned off. Class will start on time. Students can not miss more than three classes. Please note: This is a Department of Licensing requirement. All classes and failed tests (scores below 80%) must be made up within one week. The classroom portion of the course can be no less than 30 days in length. Please note: This is a Department of Licensing requirement. All lessons (classroom and behind the wheel) must be completed within 2 weeks of the end date of the course. Please note: This is to satisfy a Department of Licensing requirement that instruction be contiguous. Two hours in length: one hour for the drive lesson, one hour for observation. Students are expected to arrive for the drive lesson 5 minutes before the scheduled lesson. Instructors will start the lesson on time. The first drive may be done after the third classroom lesson. Three drive lessons must be completed before the last day of class. Please note: This is a Department of Licensing requirement. The fourth and fifth drive lessons must be scheduled by the last day of class and completed within two weeks of the end date of the course. Flip-flops are NOT to be worn during the drive lesson. They are too dangerous. No cell phones during the drive lesson, they must be turned off. No food, drink, or gum permitted in the traffic safety instruction vehicle. $40.00 if the student does not show up for a scheduled driving lesson or does not have a permit with them. $50.00 if the student does not complete the course within 2 weeks after the end date of classes. $25.00 if an open invoice exceeds 30 days or a check is returned. FULL TUITION PAYMENT IS REQUIRED TO OBTAIN A “COURSE COMPLETION”. $60.00 per hour for each extra drive lesson, whether desired or required. $25.00 for dropping the course within the first three days after the start date. After the third class there will be no refund of enrollment fee. No fee for the Department of Licensing Knowledge Test. $40.00 for the Department of Licensing Skills Test. $75.00 for a half hour practice session before the DOL Skills Test plus the test. IF A STUDENT DOES NOT COMPLETE THE COURSE WITHIN SIX MONTHS, THE COURSE WILL HAVE TO BE RETAKEN, AND FULL TUITION WILL HAVE TO BE PAID AGAIN. Behavior: Students are fully accountable for their conduct. Students can be dismissed without refund from the course for misbehavior, cheating, excessive tardiness without excuse, cell phone use during class time, misuse or abuse of equipment, willful violation of traffic laws, being under the influence of drugs or alcohol, and failure to schedule drives. Organ Donor Program: Washington State requires our course to include information regarding the organ donation program. This portion of the course is optional. Inclement Weather: We reserve the right to cancel class or scheduled drive lessons due to inclement weather. If the public schools are closed, we will cancel classroom and behind the wheel lessons. Parent/Student/Instructor Partnership: Parent involvement is critical for the student’s success. Students should study for each test and practice the behind the wheel skills we are teaching in order to progress forward to the next lesson. If a student is unable to perform the behind the wheel skills being taught, an extra drive lesson may be needed (see the Fees section of this agreement, above). Please note: the state of Washington requires each student to have at least 50 hours of guided practice, of which at least 10 hours must be at night, in order to qualify for a driver’s license. Parent/Student Responsibility: Knowing and tracking their individual attendance, deadlines, absences, and course progression, especially the behind the wheel lessons. Course Cancellation: We reserve the right to reschedule or cancel a course at our discretion due to low enrollment. We will make every effort to ensure this does not happen. In the event of a course being rescheduled or canceled we will notify our customers. Agreement: I am the legal guardian/parent of this student and give my legal consent for them to participate in this Traffic Safety Education program. I have read, understand, and agree to the policies, including the Intermediate Driver’s License Rules (IDL) mandated by the state of Washington. I will also be responsible for the payment of all tuition and fees due. I agree to allow the student’s photograph to be used in 911 promotional material. I agree to assist with guided practice in support of my student’s effort to be the best and safest driver possible.